Every day there are signs that we are stepping into autumn. As seed pods form, leaves begin to wither. About a week ago, I noticed what looked like a few orange beads on a milkweed plant down the street. 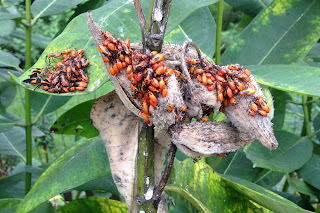 Soon it was a moving mass of safety-orange-colored insects. They are creatively called Milkweed Bugs. While this this particular plant has a pretty extreme infestation, they tend to be expected on milkweed. You can see a pair of adults on the far left leaf tip: long handsome insects with snazzy black markings on their wings. Hopefully they will leave enough milkweed for the monarch butterflies.